Voted as our book club choice from the genre "Asian Literature". The front cover says "[Kim's] writing is... often spectacular, reminding us of the sparse but beautiful prose of HARUKI MURAKAMI" - Time Out Chicago. well if that's not an endorsement I don't know what is as I love Murakami he's in my top three favourite authors. "A foreign film importer, Ki-Yong is a family man with a wife and daughter. He is also a North Korean spy who has been living among his enemies for twenty-one years. Suddenly he receives a mysterious e-mail, a directive seemingly from the home office. He has one day to return to headquarters. He hasn't heard from Pyongyang in over ten years. Why is he being called back now? Has someone in the South discovered his secret identity? 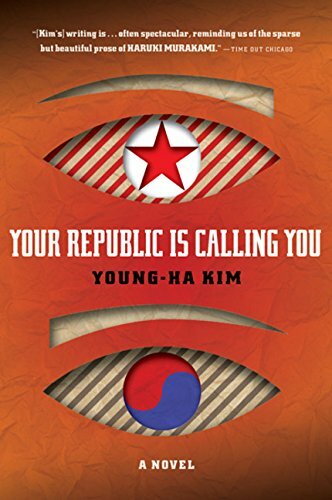 Spanning the course of one day, Your Republic Is Calling You is an emotionally taut, psychologically haunting novel that reveals the depth of one particularly gripping family secret. Confronting moral questions on small and large scales, it is a searing study of the long and insidious effects of dividing a nation." I enjoyed this book but from reading the blurb I think I expected a bit more from it in terms of it being a bit more of a thriller and so was a little disappointed that it wasn't as exciting as I thought it was going to be! I wouldn't have put it up there with Murakami. I did like the way the story was written with each chapter being an hour starting at 7am and going through to 7am the next morning. Within each chapter it was then written from various character's perpectives following the story through and whilst I enjoyed the development of some characters, there were others that I felt could have been developed further to get a better understanding of their motivations and actions. Overall, it was an interesting read but mainly for me from a political perspective about the relationships between North and South Korea. I'll be interested to hear what our bookclub members have to say about it! Actually ending up really enjoying it. He's no Murakami that's for sure but an enjoyable read about two countries that I don't really know much about. I would be interested in reading Kim's other novel "I have the right to destroy myself".